German-born Gottfried Wilhelm Leibniz was a co-inventor of calculus, which he developed independently of Isaac Newton. 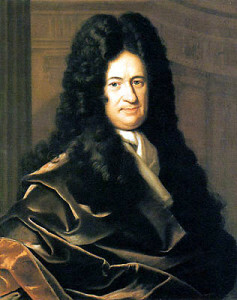 Leibniz was born in Leipzig, Germany, in 1646. His father, Friedrich Leibniz, was a professor of moral philosophy at the University of Leipzig. Although his father died when Gottfried was just six years old, the elder Leibniz left behind a significant personal library of books on philosophy and theology. Gottfried began reading every book in his father’s library – many of which were written in Latin. He was able to absorb and understand vast amounts of information well before he reached adulthood. Leibniz even mastered other languages in addition to his native German with little or no tutoring. By the time Leibniz was old enough to attend his first year of college, he was perhaps more educated and knowledgeable than even his most advanced fellow students. He entered university study at the age of 15, and by age 17, he had earned his master’s degree in philosophy. He earned his bachelor’s degree in law in 1666 at age 20. Leibniz published his first book also in 1666, which was On The Art of Combinations (De Arte Combinatoria). The main theme of the book was exploring the idea for a kind of “alphabet of human thought.” That is, in this book Leibniz proposed that all human thought or concepts were a combination or build-up of smaller units of thought or concepts. The first part of the book was an argument for the proof of the existence of God. Among Leibniz’s most amazing and early achievements was the invention of one of the first mechanical calculators, or crude computers. It was called the Stepped Reckoner and could perform addition, subtraction, multiplication and division. Although the design and concept was sound, the mechanical skills of the day were not equal to manufacturing the precision metal parts needed to make the machine work properly. Two working prototypes were produced of this machine. Leibniz’s first real job was that of an alchemist in Nuremberg. He soon found other employment, however, in rewriting the legal code of his electorate, putting his law and philosophy education to practical use. He dabbled considerably in international politics, formulating plans for the advancement of German policies after the disastrous Thirty Year’s War, which left his home country weakened, shattered, and economically backwards. In the early 1670s, Leibniz lived in Paris where he met some of the brightest luminaries of the day, including the great astronomer and mathematician Christiaan Huygens. Here he developed his mathematical skills to a high degree, which led to his development of calculus. The contributions Leibniz made to a wide range of philosophical and scientific fields is among the most stunning achievements by any single individual in all of history. Leibniz is even credited with inventing modern library science, to name just one of many accomplishments. Gottfried Wilhelm Leibniz never married, and at the time of his death in 1716 at age 70, his reputation and influence had since declined considerably for complex reasons, both political and personal.